Jersey Shore Star Announces He Has A Love Child! 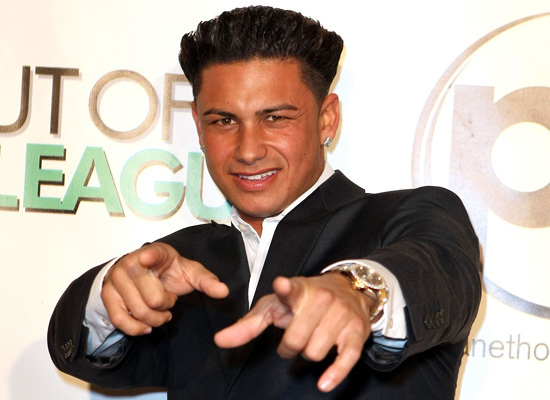 Jersey Shore star Pauly D has announced the birth of his daughter today. The 33-year-old DJ and former reality star is reportedly “very excited” to become a Dad. Click below for more details. Ronnie And Sammi Going Strong! Looks like Jersey Shore’s Sammi and Ronnie are back together and going strong! I’ll be attending the Jersey Shore Final Reunion tonight so I’ll give any updates that I find out. In the meantime, click below to see photos of them together at a recent event. Snooki Gives Birth To Baby Boy! Congratulations to The Jersey Shores’ most reckless/lovable cast member- Nicole “Snooki” Polizzi! She gave birth to her son Lorenzo Dominic Lavalle. Click below for more details. Style: Snooki Rocks Cheetah Leggings And Hot Pink Heels! Click below to view Snooki’s hot pink heels with cheetah print leggings, definitely a stylish and trendy look (or at least it is here in NJ).